I’ll be straight with you: I’ve never been much of a pump filter guy. Of the popular backpacking pump filters on the market, they were either too bulky, too heavy, too cumbersome, too expensive, or too prone to clogging (or a combination of all) to really find their way into my pack. I’ve been content to use chemical treatments mostly, primarily Chloride Dioxide, as a safe, lightweight, inexpensive, and effective water treatment. This all changed when all my backpacking buddies starting reviewing the Sawyer Mini (if you haven’t seen Stick’s First Look video on the Mini, please do; he does a great job covering the Mini and how it evolved from the Squeeze). Up to that point, I still hadn’t thought much of it, but when lightweight backpacking enthusiasts start abandoning “traditional” lightweight options in favor of the Squeeze and Mini, I had to give it a second look (what was I missing?). So when Patrick from Sawyer contacted me about doing a review of the new Mini, I was eager to try it on. If you’ve been following my reviews, you’ll know that I prefer to trail test all the gear I receive before doing a review. Occasionally I’ll do a First Look post, but my preference is to make no predictions or assumptions and just try it. So, while reviews have been popping up everywhere on the Sawyer Mini, I was still in the field giving the Mini a spin :). First off, I am impressed at multiple levels with the Sawyer Mini: it is light, small, easy-to-use, and inexpensive. On top of that, the filtering mechanism beats out any other filter on the market with a best-of-class 0.1-micron absolute filter that blocks 99.9% of bacteria and protozoa (viruses are still not blocked with any filter). It boasts of filtering 100,000 gallons of water, and yet the company says the filter can last even longer with careful use and regular cleaning. After using the Mini, it tipped the scales at only 59 grams (2.08 oz). For $25, that’s hard to beat. The filter can be used in a few ways, but the bottom line is that the filtered water can be consumed immediately. This is a big plus, especially compared with chemical treatments that often take 30 minutes or more to be effective. On my latest trip, I used the Sawyer Mini and a small water bottle as we hiked along West Clear Creek. 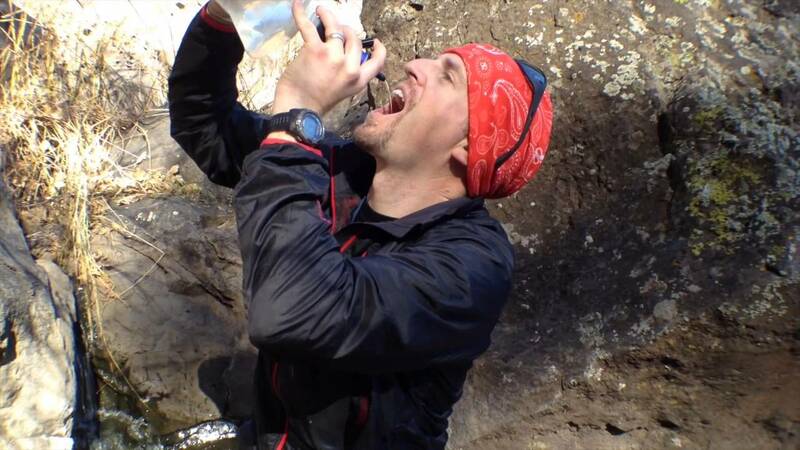 Instead of carrying water, I simply dipped into the stream and drank directly through the filter when I was thirsty. It was great! The biggest challenge, from my point of view, is that it takes a little extra time and effort to keep “contaminated” (unfiltered) water from getting consumed. In my video review, you’ll notice a few “sloppy” mistakes such as not screwing the filter tightly onto my water bottle, allowing some unfiltered creek water to splash onto my face and stream down the outside of the filter. Also, by dipping the Sawyer water bottle into the creek, not only does my hand get soaked, but the entire bottle is dripping with unfiltered water that easily slides down the sides of the filter and into my mouth. Casual mistakes, such as this, are easy to do with such a direct-to-drink device. This is one trade-off by eliminating the pumps and hoses that add some physical separation between filtered and unfiltered water. Keeping a cotton bandana close by and using it to wipe up spills or leaks is one way to be vigilant and keep everything clean and wiped down. Most every treatment method has some of these challenges and trade-offs so the real key is to practice and be aware of the process to avoid problems and “newbie” mistakes. The second and probably last “issue” I had when using the Sawyer Mini was the included 16 oz collapsable water bottle. This water bottle is designed to be used to collect untreated water and to attach to the Mini for filtering. The plastic on this bottle is very rigid and my first attempts at dipping in the creek to get water were less effective. In slow-moving water, it was difficult to fill. I could barely get a few swallows of water in the bottle. It wasn’t until after this trip that I noticed the bottle had a gusseted bottom—it was that stiff. A technique I used later that worked for me was to blow a puff of air into the bottle and inflate it, like a balloon, to get the bottle open. With the bottle now open, it was much easier to fill it in slow-moving or standing water. 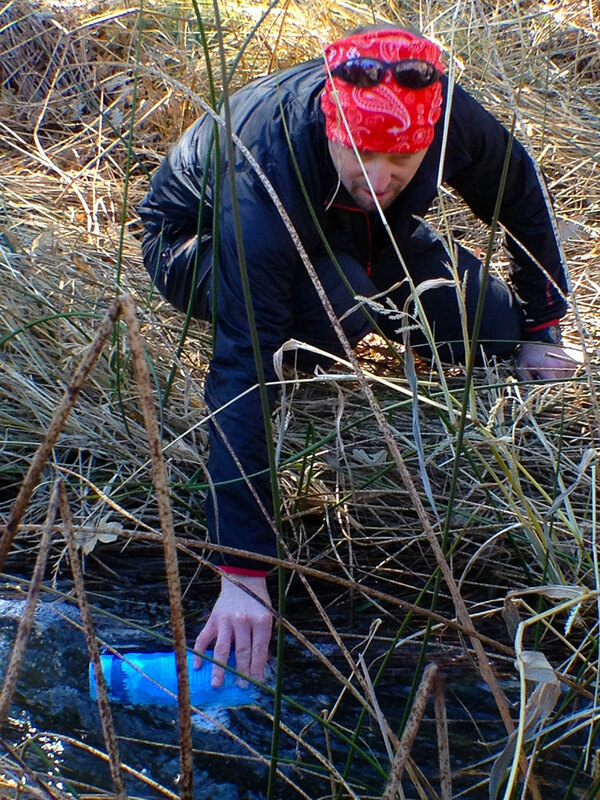 In rushing creeks or waterfalls, it is easy to fill the container. I’m grateful the Mini uses standard threads because it meant I could use it on my Platypus water bladders and “disposable” water bottles alike. 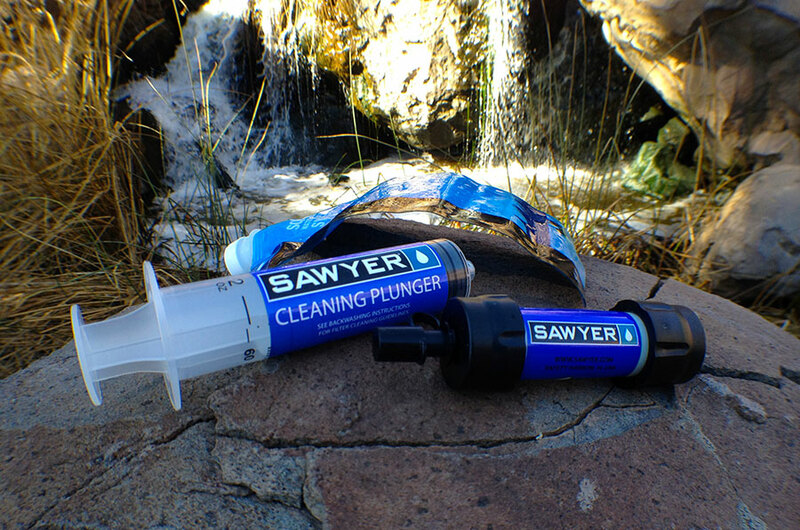 There is no doubt that I’ll continue using the Sawyer Mini filter backpacking and hiking. As I mentioned before, there are so many advantages to this filter that the decision was easy. In fact, I plan on getting a few for Christmas gifts and to supplement my home emergency kits. In the future, I’ll probably leave the 16 oz Sawyer bottle at home and use other containers instead for water collection. Derek…first of all, I love your site! I live in Phoenix and work as tour guide at Grand Canyon during the summers, so it would be great to meet you sometime. Anyway…have you ever tried the Platypus Gravityworks system? It’s pretty lightweight (10.75 oz. according to the online specs), and it doesn’t have quite the same potential for cross-contamination as the Sawyer systems. The Gravityworks is also a little hard to fill in slow moving and stagnant water but it’s great in rushing streams. With a 4 liter capacity, you can filter a whole bunch of water in a matter of minutes, so it’s super efficient if you have other folks with you. I bought one earlier this year and really like it. This is pretty good, I’ve seen it about and for the price this seemed too good so the review is reassuring.